For the Carnegie Science Center hosting of the traveling exhibit by Nathan Sawaya, The Art of the Brick, Senior Director of Exhibits and Experience Dennis Bateman was thinking outside the box with how to integrate the hands-on exploration, for which the museum is known, with the critically-acclaimed collection of original artwork and re-imagined masterpieces all created from the recognizable and beloved LEGOs. 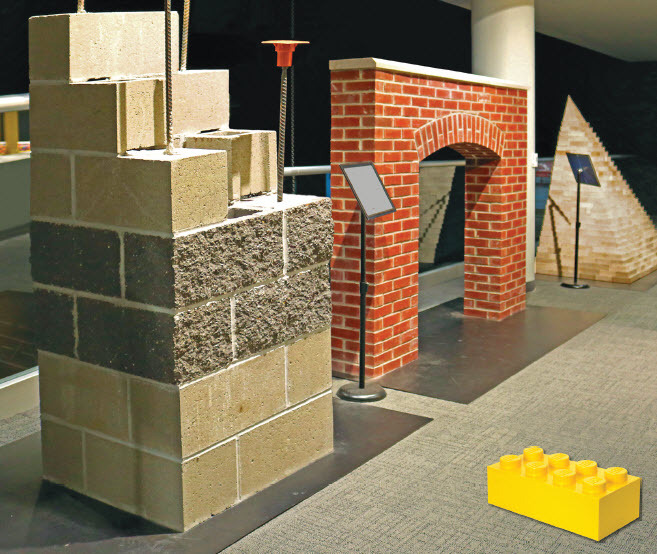 Arch Masonry, Pittsburgh, was on board as a sponsor of the exhibit already when Bateman approached them about building an actual masonry display to welcome visitors into The Art of the Brick gallery in the PPG Science Pavilion. The Center specifically asked for a masonry arch, but extended the parameters to include anything educational. In order to showcase the masonry materials and meet the Center’s objective, Arch Masonry’s President Joe Bonifate decided to create three displays showing the progression of structural masonry. The first is a pyramid using large masses of dry stacked stonework reminiscent of the great Egyptian pyramids. The second is the brick arch that introduces mortar to the assembly and showcases masonry’s ability to use its own geometry to hold up the structure. Finally, a concrete masonry unit column with reinforcement is shown as an element that functions primarily to support another element of a building, such as a roof truss. Each masonry structure is displayed with a description and some technical explanation of the arch from BIA Tech Notes and the column from NCMA TEK. Skilled bricklayers from Arch Masonry donated labor. Materials were donated by RI Lampus and Generation Stone Works, Greater Pittsburg. The exhibit is on display at the Carnegie Science Center in Pittsburgh, PA through January 7, 2019.